Many mines are “wet”: and the source of water is often a concern for mining operations. Recent research has shown that saline fracture waters in Precambrian rocks, with groundwater residence times ranging from millions of years  to billions of years , provide evidence of a previously unrecognized domain of the terrestrial hydrosphere. Here we report on results from > 30 sites and > 250 samples and boreholes in continental Precambrian sites worldwide – drawing specifically on examples from mining sites in Canada and South Africa. These ancient fracture waters, accessed via mines and underground research laboratories, contain mM concentrations of reduced gases, as well as high concentrations of noble gases predominantly sourced via radiogenic reactions in the crust. First identified in results from the deep gold mines of the Witwatersrand basin in South Africa , novel radiogenic isotope signatures have now been shown to be a consistent feature of these deep waters  and to provide important information about the origin and residence time of mine waters. Integration of the noble gas signatures with compositional and isotopic information for the reduced gases provide constraints on the residence time of the fracture waters, the degree of interconnectivity of different groundwater systems, and an estimate of the amount of time these waters have been isolated from the surface. This presentation will addressthe distribution of ancient fluids at selected key reference sites in Canada and South Africa; and the controls of this deep hydrosphere on the biodiversity and distribution of the subsurface microbial biosphere. References:  Lippmann-Pipke et al. (2011) Chem. Geol. 283, 287-296. Holland et al., (2013) Nature 497, 367-360. Lin et al. (2006) Science 314, 479-482. Dr. Barbara Sherwood Lollar, FRSC is a University Professor in Earth Sciences at the University of Toronto. She completed her studies at Harvard, Waterloo, and Cambridge in the United Kingdom before joining the University of Toronto in 1992. 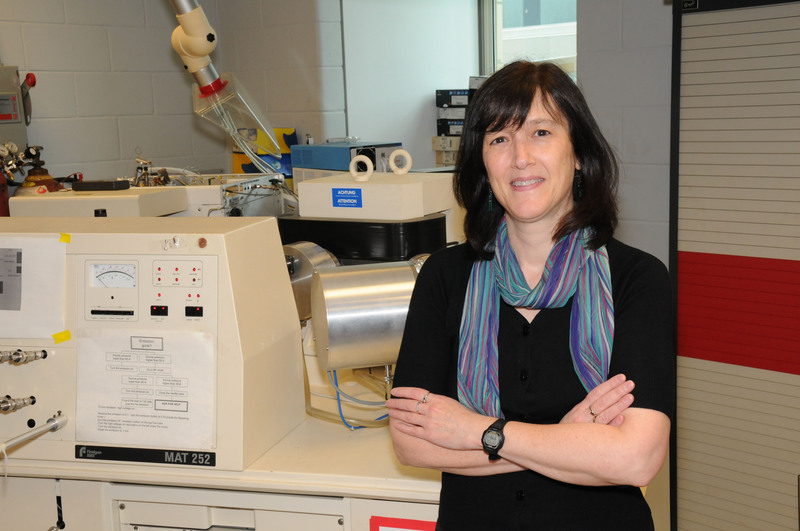 She is a CRC Tier I Chair in Isotopes of the Earth and Environment, Director of the Stable Isotope Laboratory, Senior Fellow of Massey College and Vice-President of the Geochemical Society. Sherwood Lollar has published extensively in research on stable isotope geochemistry to investigate groundwater remediation, to track the fate of carbon-bearing fluids and gases such as CO2, CH4 and H2 in ancient fracture waters in the Earth’s crust, and to investigate the role of deep subsurface microbial populations in carbon cycling. She has been a recipient of many academic awards (including the NGWA Darcy Lecturer, Steacie, Killam and NSERC Accelerator Awards) and most recently the 2012 Eni Award for Protection of the Environment and 2012 Geological Society of America Geomicrobiology and Geobiology Prize. Sherwood Lollar was selected in 2000 by Time Magazine Canada for their feature on ”Leaders for the 21st Century” and by Canadian Geographic in 2013 for their list of Ten Canadians “Changing the World” along with director/ solo submersible diver James Cameron and Astronaut Chris Hadfield.